The next year to strew its fragrance with lots of hopes and appetence is very close to knock your door. The time is to say Goodbye to the 2014 and to welcome the next year with your friends or family. 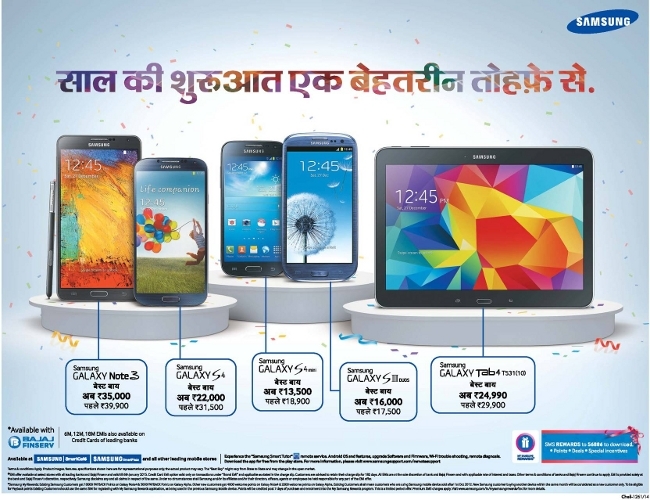 To make this New Year more special for you, Samsung has decided to gift India happiness in the shape of an offer. If you are thinking to gift a new gadget to your loved one to make him/her New Year special, then the Korean mobile maker has some exciting offers on its number of devices. Samsung is offering its array of devices at a best buy price specially to welcome 2015 with razzle-dazzle. The Company is offering Galaxy Note 3, Galaxy S4, Galaxy S4 mini, Galaxy S III Duos, and Galaxy Tab 4 at a reduced price. You can also buy all these handsets on easy EMIs of 6, 12, or 18 months. You can buy any of devices as per your choice and budget. Below is the price, offering by the Company on these devices for making your new year best.